Keep an eye out for dinners, coming soon! If you’ve been lucky enough to travel to the French or Italian countryside, chances are you’ve been blown away by the food. Chef Greg Feck (ex Richmond Hill Cafe and Larder), who has worked with everyone from Jamie Oliver to Stephanie Alexander, was so inspired by the quality of his overseas dining experience that he opened Crabapple Kitchen last week as a tribute to his travels. Greg’s seasonal menu uses the finest Victorian produce available and is a beacon of light on the otherwise stale Glenferrie Road strip in Hawthorn. 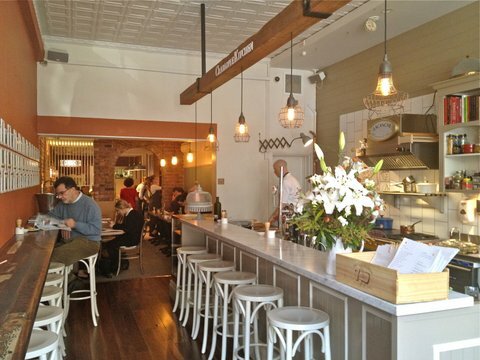 The breakfast menu is a mix of classics and original dishes. 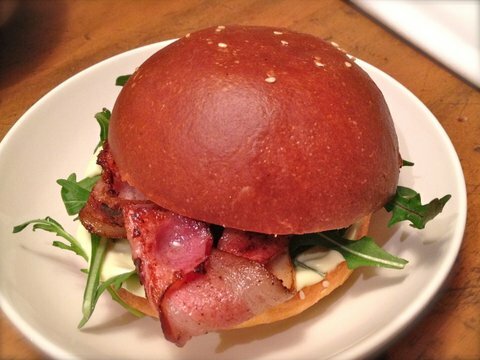 For something different, order the incredibly moresome ‘Jum & Bender Sarnie’ with H.P sauce, aioli, crisp bacon and rocket, united in a melt-in-the-mouth sesame brioche bun. We were also tempted by the baked eggs in a Northern Indian style curry with lentils and caraway seeds, heirloom carrots, spiced yoghurt and grilled wholemeal flatbread, a replica of a meal eaten in Jalandhar City in India, but decided to stick to what we knew. 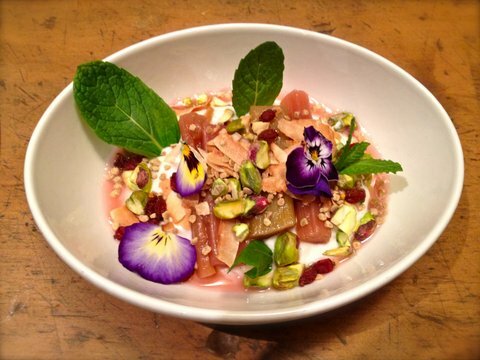 We ordered the exquisitely presented vanilla yoghurt with rosewater poached rhubarb, toasted coconut, barberries, pistachio and mint, decorated with delicate purple flowers. Fragrant and floral, it is only $7.50, but it’s worth noting it’s better ordered as well as another dish (it’s tiny!). 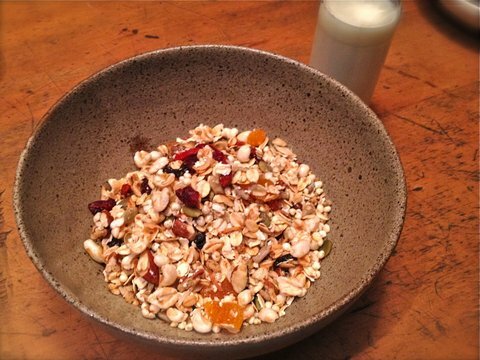 The perfect accompaniment is Crabapple’s own natural muesli with oats, Goji berries, figs, raw almonds, cranberries, sunflower seeds and puffed corn. For a cooked breakfast, I can highly recommend the homemade Baked Beans: cannellini beans braised in rich tomato with garlic and herbs, melted Taleggio and some multigrain toast on the side for mopping. 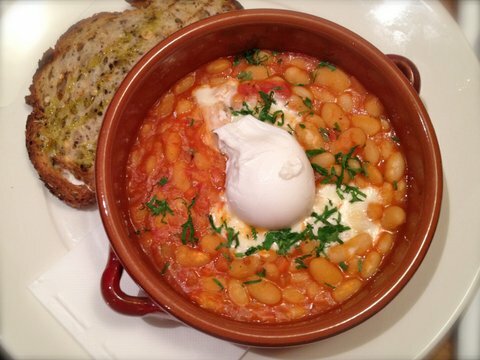 I also suggest you add a poached egg; it wouldn’t be breakfast without it and there’s something extremely satisfying about watching that yolk flood over the beans. 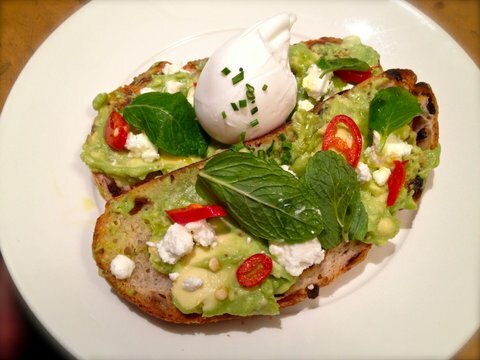 Less impressive, but simple and flavoursome nonetheless, was the avocado on olive toast with Meredith Dairy soft feta, lemon, chilli, mint and avocado oil. Again, add the poached egg. If the kiddies are fussy, there’s even soft-boiled eggs with “mousetraps” (vegemite and cheese soldiers) that are sure to keep them happy. 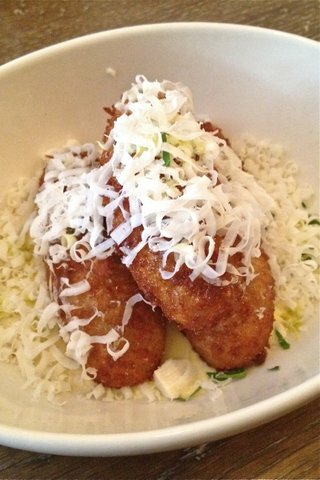 We visited again a week later for a ‘pre lunch snack’ and found ourselves moaning over the golden tuna and broccoli croquettes with smoked tuna dust and salted ricotta, swimming in a divine sweet corn puree. 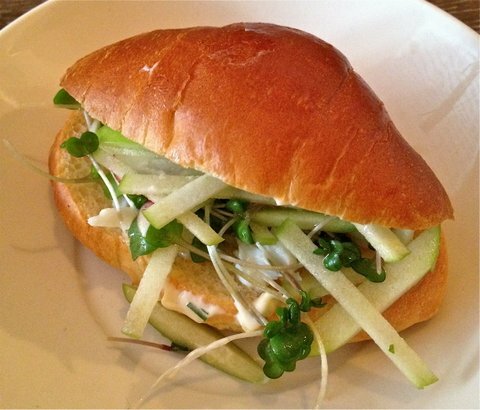 The Crabapple Slider (pictured top) with sweet spanner crab, crunchy julienned apple, breakfast radish, mustard cress and mayo in a buttery brioche bun was also a winner, while dishes like slow-cooked pork with French lavender and four-cheese ravioli with truffled cauliflower would be better suited to those not about to go out for lunch! Wine is served by the glass and features mostly Australian varieties, punctuated by a white from Austria here and a red from Italy there. Order some red to complement your charcuterie, which arrives freshly sliced by an original Berkel meat slicer. The décor at Crabapple Kitchen is decidedly homely: banquettes are highlighted with colourful fabric cushions, potted herbs sit next to a rustic redbrick arch, some seats are made from old cider crates and a sprinkling of flowers greet all who enter. Crabapple Kitchen is old school in a Provencal kind of way, cozy and nostalgic without compromising service (we were double checked, triple checked, and then offered more hot water for our teapots as soon as ours was out). It’s the ultimate spot to reminisce about the good ol’ days over beautiful food; so go on, pick up the phone and catch up with that person you keep meaning to call. Parts of this blog post were first published in Agenda City.